Since Alexis de Tocqueville first made the linkage in his writings on America, a healthy democracy has been associated with the flourishing of civil society, as measured by popular participation in voluntary and civic activities and the vitality of organizations that mediate between the individual and the state. 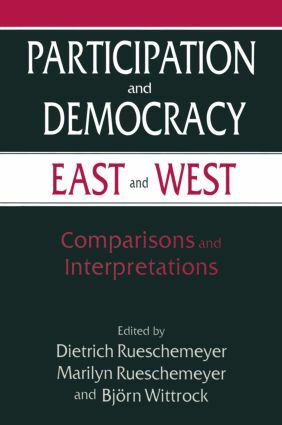 This volume takes a fresh look at this classic theme in the context of post-communist Eastern Europe, the West European welfare states and the United States, asking: what patterns of participation characterize the new democracies of Eastern Europe? ; what levels of civic activism are characteristic of contemporary Western democracies? ; what factors account for differences among countries and changing patterns over time? ; and what do findings suggest about the prospects for democracy in the 21st century? The Self-Organization of Society and Democratic Rule - Specifying the Relationship, Dietrich Rueschemeyer; Institutions and Actors in a New Democracy - the Vanishing Legacy of Communist and Solidarity Type Participation in Poland, Andrzej Rychard; Local Democratization in the Czech Republic After 1989, Michal Illner; Participation and Transition - Can the Civil Society Project Survive in Hungary?, Ferenc Mislivets; The Social Democratic Party in Eastern Germany - Political Participation in the Former GDR After Unification, Marilyn Rueschemeyer; The State, Associations and the Transition to Democracy in Sweden, Bo Rothstein; The Norwegian Voluntary Sector and Civil Society in Transition - Women as a Catalyst of Change, Per Selle; Social Alliances and Coalitions - the Organizational Underpinnings of Democracy in West Germany, Bernhard Wessels; Bowling Alone - Democracy in America at the End of the 20th Century, Robert Putnam; Conclusion - Contrasting Patterns of Participation and Democracy. (Part contents).